Thanks to supporters like you, these cats in our rescue projects and sanctuaries in India, received food, medical attention and loving care! Sadly not many cats in India are so fortunate. Generally cats are not as loved as they are in the United States, Europe, Australia and other parts of the world. There are many superstitions towards cats and some believe they are a bad omen or even that there is magical healing power to be gained by drinking their blood. In some rural areas cats are eaten. In India if you don't see many cats on the streets, it is because street dogs have harassed and hunted them. And conditions are just too rough for them to survive on the street. Another cause is when stray cat populations become a problem; cat catchers (a “profession” taken up by poor tribal people) are hired who cull the cats by lassoing and netting them. These cats are then brutally (and illegally) killed and sold to restaurants as meat! Further, care for cats is limited in India because there is a common perception that to clean up after animals, particularly cats, equates to a low status in life. This is one reason why there are few cat shelters. In urban areas, street cats live on the garbage they can scavenge. Cats that forage for mice often die after consuming poisoned rodents. Poison is commonly used in India to reduce rodent populations. Among people in India who do care for their companion cats, there is widespread resistance to spaying and neutering. This is because veterinary standards have traditionally been so poor that cats may not survive surgery. Outside the urban areas, veterinary services for cats simply aren't available. As a result, cat hoarders can be found all across India. Better veterinary education and services are desperately needed to bring cat populations under control and to improve the quality of their lives. 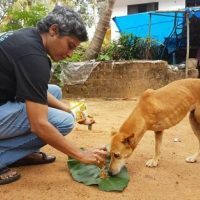 International groups like Help Animals India and domestic programs within India are training veterinarians in safe, effective spay and neuter procedures while also improving veterinary standards all around. Help Animals India and others are also teaching people proper cat care. 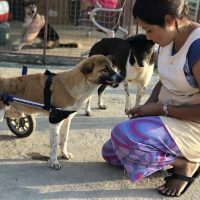 In India, companion animals are a relatively new concept and education for their care is greatly needed. Thank you for your ongoing support and compassion for cats in India!